Is one of football's longest relationships coming to an end? 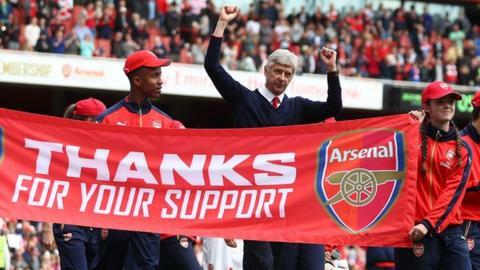 Arsene Wenger has been in charge of Arsenal for 21 years but a disastrous week has perhaps left his future in more doubt than at any other time during his reign. A seventh successive exit at the last-16 stage of the Champions League was painful enough, without the added humiliation of a 10-2 aggregate hammering by Bayern Munich. The protests against Wenger have rumbled in the background for years but now seem to have an extra fervency. Throughout all this, a new contract offer remains on the table, while the 67-year-old says the opinion of fans will influence his decision over whether to remain in charge.